For other people named Michael or Mike Brown, see Michael Brown. Michael Thomas Brown (born September 8, 1975) is a retired American mixed martial artist who competed at Featherweight in the UFC. A professional competitor since 2001, Brown is a former WEC Featherweight Champion, and has also fought in the Japanese promotion DEEP, as well as BodogFIGHT. Brown wrestled at Bonny Eagle High School in Standish, Maine where he won a State Championship in 1992, his junior year. He went on to wrestle at Norwich University where he was known for his ability to focus. Although he was an average student in high school, he was able to apply his focus to academics and excelled as a scholar-athlete in college. According to Norwich wrestling Coach Rich Hasenfus, Brown was one of the smartest athletes and strongest wrestlers at Norwich. Brown had fought in several MMA events including most recently WEC, where he was the Featherweight Champion. In 2005, Brown suffered a near career-ending loss at DEEP 22 in Japan. Brown's opponent, noted leg-lock expert Masakazu Imanari, dislocated Brown's leg to the point that his leg was pulled out and to the side of his knee joint. His only other Pre-WEC losses were to world-class fighters; besides Imanari, only Joe Lauzon, Genki Sudo, and Hermes Franca (all UFC veterans) had defeated Brown en route to Brown's 18–4 record. Riding a six-fight win streak, Mike Brown signed with the WEC's Featherweight division. His debut in the WEC was against Brazilian Jiu-jitsu expert Jeff Curran at WEC 34. In each round, Brown matched Curran's stand-up and then took him down and scored from the top with elbows and punches. Brown won all three rounds en route to a unanimous decision victory. Brown was then offered a shot at the WEC Featherweight Championship with a fight against Urijah Faber at WEC 36. The fight was originally set to take place in Hollywood, Florida on September 10, 2008, but it was postponed to November 5, 2008, due to Hurricane Ike. At the time, Faber had held the title for over two and a half years and was widely considered to be the best fighter at 145 pounds in the world. Brown welcomed the opportunity to fight the best in the world and felt that his training with American Top Team had prepared him well. When the heavily-favored Faber attempted a risky elbow strike, Brown countered with a right hook to the jaw, knocking down the champion. Brown then followed with a flurry of unanswered punches and the fight was called off at 2:23 of the first round. Brown won by technical knockout and was declared the new WEC featherweight champion. Brown's first title defense came against Texas-native Leonard Garcia in Corpus Christi, Texas as the main event of WEC 39. Garcia came out very aggressively, but he made a mistake and circled in the wrong direction. Brown capitalized on the mistake, knocking Garcia down with a big right hand. He followed with a barrage of punches and elbows, one of which opened up a cut on Garcia's forehead. Brown took Garcia's back and worked unsuccessfully for a rear-naked choke. Garcia got Brown back in his guard, but Brown passed into a full mount and secured an arm-triangle choke. Garcia tapped out at 1:57 of the first round. Brown said that he did not really feel like the champion after the Faber fight, but he was happy he established himself as the champion with his victory over Garcia. Brown's second defense came in a rematch against former champ Urijah Faber as the main event of WEC 41: Brown vs. Faber 2. The bout took place at ARCO Arena on June 7, 2009, in Sacramento, California. Urijah Faber was defeated a second time by Brown via unanimous decision in front of his hometown crowd in Sacramento. The score cards read 49–46, 48–47 and 49–46, all in favor of Brown, solidifying him as the best Featherweight in the world. MMA websites Sherdog.com and ESPN.com both stated that "Faber's right hand was no match for the top of Mike Brown's head". Following his unanimous Dec win over Faber (for the second time), Brown lost his WEC Featherweight Championship against José Aldo on November 18, 2009, at WEC 44. Brown lost by knockout in the second round. Brown defeated WEC newcomer Anthony Morrison on January 10, 2010, at WEC 46 via first round submission. Brown took on Manvel Gamburyan on April 24, 2010, at WEC 48. Gamburyan defeated Brown via KO in the first round. Mike Brown's next fight was against Cole Province at WEC 51. He won the fight via TKO (punches) in the first round. Brown first faced Diego Nunes on January 1, 2011, at UFC 125. He lost the fight via split decision. Brown jumped right back into action to face Rani Yahya on January 22, 2011, at UFC Fight Night 23, replacing an injured Chan Sung Jung. He lost the fight via unanimous decision. Brown was out until mid-2011 recovering from surgery on his hand that was injured during the Yahya bout. On August 6, 2011, Brown faced Nam Phan at UFC 133. He won the fight via unanimous decision, earning him his first UFC victory. Brown was expected to face Vagner Rocha on January 20, 2012, at UFC on FX 1. However, Brown was forced out of the bout with a knee injury. Brown faced Daniel Pineda on May 26, 2012, at UFC 146. He defeated Pineda by unanimous decision. In an interview with Ariel Helwani following the fight, Brown stated that he would give himself two weeks to consider retiring based on how his body felt after recovering. On July 4, 2012, Brown signed a 5-fight deal with the UFC. Brown was expected to face Akira Corassani on August 17, 2013, at UFC Fight Night 26. However, Corassani pulled out of the bout and was replaced by Steven Siler. Brown lost the fight via knockout in the first round. Brown was expected to face Estevan Payan on April 19, 2014, at UFC on Fox 11. However, Brown was forced out of the bout with an injury and was replaced by promotional newcomer Alex White. After pulling out of the fight against Payan, Brown said he would likely not fight again, though he did not say he was retiring. Win 10–3 Renato Tavares Decision (unanimous) AFC 10: Absolute Fighting Championships 10 October 30, 2004 3 5:00 Ft. Lauderdale, Florida, United States Defended AFC Featherweight Championship. Loss 9–3 Joe Lauzon Submission (rear-naked choke) CZ 8: Street Justice October 2, 2004 3 2:14 Revere, Massachusetts, United States For vacant USKBA U.S. Super Welterweight Championship. Win 9–1 Leigh Remedios Decision (unanimous) AFC 6: Absolute Fighting Championships 6 December 6, 2003 3 5:00 Ft. Lauderdale, Florida, United States Won AFC Featherweight Championship. ^ Steve Solloway (2008-11-12). "Yes, the king of the featherweights is a Mainer". The Portland Press Herald/Maine Sunday Telegram. Archived from the original on 2013-01-03. Retrieved 2009-03-05. ^ Gary E. Frank (2008-12-05). "Mixed martial arts champion Mike Brown found his path at Norwich". Norwich University Office of Communications. Retrieved 2009-03-05. ^ "Deep - 22 Impact". Sherdog. ^ Mitch Gobetz (2008-05-30). "Brown looking to leap over big frog at wec 34". MMAWeekly. Archived from the original on 2008-06-06. Retrieved 2009-03-04. ^ Ricardo Mendoza (2008-06-02). "Wec 34: hometown hero faber edges out pulver". MMAWeekly. Archived from the original on 2008-07-03. Retrieved 2009-03-04. ^ "Sherdog Official Mixed Martial Arts Rankings – Featherweight". Sherdog. 2008-10-08. Retrieved 2009-03-05. ^ Jeff Cain (2008-11-04). "MIKE BROWN IS READY TO FOIL FABER, TAKE TITLE". MMAWeekly. Archived from the original on 2008-12-07. Retrieved 2009-03-04. ^ Tim Leidecker (2008-11-07). "WEC Analysis: Faber's Loss Limits Options". Sherdog. Retrieved 2009-03-05. ^ Tom Hamlin (2008-11-05). "Faber loses the crown to brown". MMAWeekly. Archived from the original on 2008-12-09. Retrieved 2009-03-04. ^ Damon Martin (2009-02-26). "Brown says the title makes it all worth while". MMAWeekly. Archived from the original on 2009-03-04. Retrieved 2009-03-04. ^ Damon Martin (2009-03-01). "Mike brown pummels garcia to retain title". MMAWeekly. Archived from the original on 2009-03-06. Retrieved 2009-03-04. ^ Joe Hall (2009-03-01). "Brown Blasts Garcia, Finishes with Sub". Sherdog. Retrieved 2009-03-04. ^ Brian Knapp (2009-03-30). "Brown-Faber Sequel Official for WEC 41". Sherdog. Retrieved 2009-03-31. ^ "Brown-Aldo Set for November WEC". Sherdog. 2009-07-15. Retrieved 2009-07-15. ^ "WEC 46: Varner vs. Henderson results". wec.tv. January 11, 2010. ^ "Mike Brown vs Manny Gamburyan on tap for WEC 48 on April 24". mmamania.com. February 3, 2010. ^ "WEC 48: Aldo vs. Faber – Live Results and Commentary". BLOODYELBOW.com. 2010-04-24. Retrieved 2010-04-25. 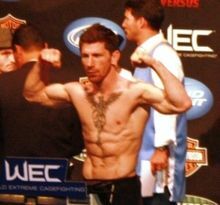 ^ "WEC vets Mike Brown and Diego Nunes targeted for UFC 125 matchup". mmajunkie.com. November 10, 2010. Archived from the original on November 12, 2010. ^ "Replacement Mike Brown steps in to meet Rani Yahya at UFC Fight Night 23". mmajunkie.com. Archived from the original on 2011-01-08. Retrieved 2011-01-07. ^ Mike Chiappetta. "Former Champ Mike Brown Spared Cut, Recovering From Hand Surgery". MMA Fighting. ^ "Featherweights Mike Brown vs. Nam Phan slotted for UFC 133 in Philly". mmajunkie.com. May 11, 2011. Archived from the original on May 13, 2011. Retrieved May 11, 2011. ^ "Mike Brown vs. Vagner Rocha added to UFC on FX 1". mmajunkie.com. November 29, 2011. Archived from the original on December 1, 2011. ^ "UFC On FX Fight Card: Mike Brown Scratched With Knee Injury". mma.sbnation.com. December 30, 2011. ^ "Mike Brown vs. Daniel Pineda added to May's UFC 146 event". mmajunkie.com. March 14, 2012. Archived from the original on March 17, 2012. ^ "Mike Brown: 'I'm Getting Near The End'". mmafighting.com. May 27, 2012. ^ "Mike Brown vs. Akira Corassani set for UFC on FOX Sports 1 1 in Boston". mmajunkie.com. May 31, 2013. ^ Staff (2013-07-01). "Akira Corassani off UFC on FOX Sports 1 1 card, Steven Siler meets Mike Brown". mmajunkie.com. Retrieved 2013-07-01. ^ Matt Erickson (2014-02-26). "Sean Soriano out, Mike Brown meets Estevan Payan at UFC on FOX 11". mmajunkie.com. Retrieved 2014-02-26. ^ Staff (2014-04-04). "Mike Brown out, Estevan Payan now meets newcomer Alex White at UFC on FOX 11". mmajunkie.com. Retrieved 2014-04-04. ^ Mike Bohn (2014-04-15). "UFC featherweight Mike Brown: I don't think I'll fight again". mmajunkie.com. Retrieved 2014-08-29. ^ "Fcf Survey". Full Contact Fighter. ^ Kevin Ehsani. "Brown has managed to transfer his abilities into a role outside of the cage". CombatPress.com. Retrieved January 12, 2017. ^ Zach Aittama. "Mike Brown earned his way to the top of the sport with his coaching ability of numerous well-respected fighters". CombatPress.com. Retrieved January 23, 2018. ^ Dan Kuhl. "For the third year in a row, American Top Team's head coach and former WEC champion Mike Brown steals the title of Combat Press Coach of the Year". CombatPress.com. Retrieved January 25, 2019. ^ "Afc Results". Full Contact Fighter. ^ "Pride Fc 22 "beasts From The East 2" Dvdin Stock Now!". Full Contact Fighter. Wikimedia Commons has media related to Mike Brown (fighter).